Product Condition: The Whisper Sandal - Women's is in Excellent condition. This item was previously owned for _______. The following observations were made concerning this item. * All items sold as is, all warranties void. 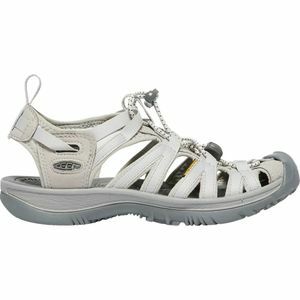 Pull on the KEEN Womenâ€™s Whisper Sandal before you take on the white caps at the Royal Gouge. Keen gave this sandal a heel strap and quickdraw elastic cord to ensure you donâ€™t lose your sandals when you step into rushing water. The polyester webbing with antimicrobial treatment prevents your feet from smelling like a river bed when youâ€™re back at camp, and KEENâ€™s patented toe protection prevents underwater debris from slowing you down. The EVA footbed keeps your dogs comfortable for the long haul, and the grippy rubber sole helps you stay upright on slippery surfaces.